This page will walk through Angular Material inputs example. Angular Material provides MatInput Directive to create <input> and <textarea> element with a MatFormField. To use MatInput we need to import MatInputModule in application module. MatInput provides errorStateMatcher property to assign ErrorStateMatcher object to control when to show validation error. The selector of MatInput is matInput. Inputs are used with MatFormField that applies common underline, floating label and hint messages etc. The selector of MatFormField is <mat-form-field>. We use <mat-label>, <mat-hint>, <mat-error> with <input matInput> and <textarea matInput> inside <mat-form-field>. Angular Component Dev Kit (CDK) provides CdkTextareaAutosize Directive to automatically resize a textarea to fit its content. It provides cdkTextareaAutosize property to enable autosizing, cdkAutosizeMinRows property to define minimum amount of rows and cdkAutosizeMaxRows property to define maximum amount of rows in the textarea for autosizing. CdkTextareaAutosize also provides resizeToFitContent() method to resize the text area to fit its content and reset() method to reset the textarea to original size. On this page we will create Angular Material inputs and validate it. 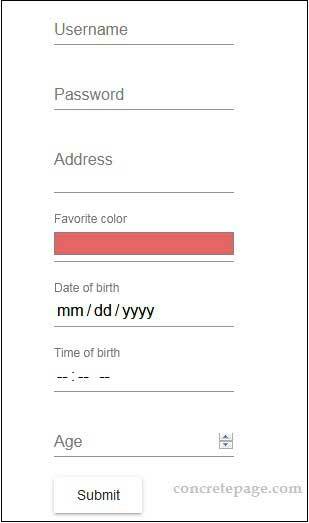 We will create input text, color, date, time, number and textarea using reactive form as well as template-driven form. To work with Angular Material <input> and <textarea>, we need to import MatInputModule in application module. Angular Material uses MatInput Directive to create <input> and <textarea> inside a <mat-form-field>. MatInput Directive selector is matInput. It is used with color, date, datetime-local, email, month, number, password, search, tel, text, time, url, week input types and textarea. errorStateMatcher: This is ErrorStateMatcher object to control when error messages are shown. readonly: This is Boolean value to know if element is readonly. type: It gives input type of the element. errorState: This is Boolean value to know if control is in error state or not. Find the sample code snippet to create <input> and <textarea>. 1. Find the code snippet to create <input> using matInput selector. Find the code snippet of TS file. 2. Find the code snippet to create <textarea> using matInput selector. <input matInput> and <textarea matInput> are used inside <mat-form-field>. It applies common underline, floating label and hint messages etc. <mat-form-field> is used with <input matInput> as given below. Suppose we have a FormControl object as following. Now find the HTML template code. Now find the HTML template code to create textarea. We will validate input text here. We will validate for required, maximum value and minimum value of a number using Validators and FormControl. Find the code snippet of TS file. 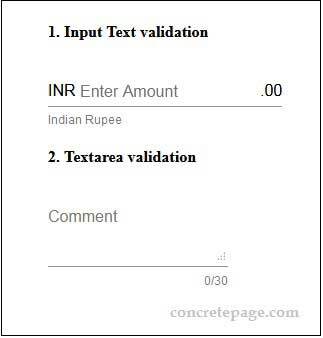 We will validate input <textarea> here. We will validate for required, maximum length using Validators and FormControl. Find the code snippet of TS file. Find the print screen of the output for input and textarea. Angular Material provides ErrorStateMatcher to control when to show error. It has isErrorState() method that accepts FormControl and FormGroupDirective or NgForm as arguments and returns Boolean. To create custom ErrorStateMatcher class, we need to implement ErrorStateMatcher and override isErrorState(). If isErrorState() returns true, error will be shown and if false then error will not be shown. To use it with <input> and <textarea> input, MatInput Directive provides errorStateMatcher property. We need to assign the object of custom ErrorStateMatcher to errorStateMatcher property. Find our custom ErrorStateMatcher. Our custom ErrorStateMatcher can be used for a <input> and <textarea> using errorStateMatcher property or globally for every <input> and <textarea> in the application. a. To use errorStateMatcher property, we will create an instance of CustomErrorStateMatcher in TS file. Now use esMatcher object with errorStateMatcher property. b. To use custom ErrorStateMatcher globally, configure provider in application module as following. Now CustomErrorStateMatcher will be applied to all <input> and <textarea> element in the application. Angular material also provides ShowOnDirtyErrorStateMatcher that matches when a control is invalid and dirty. CdkTextareaAutosize Directive is used to automatically resize a textarea to fit its content. Component Dev Kit (CDK) provides high quality predefined behavior for the components. CDK allows us to add common interaction patterns with minimal effort. Find the CdkTextareaAutosize properties to use with textarea. It defines whether autosizing is enabled or not. cdkTextareaAutosize is used with <textarea> element. It is declared in CdkTextareaAutosize Directive as following. We can use enabled property in TS file to know if autosize is enabled or not. It defines minimum amount of rows in the textarea for autosizing. cdkAutosizeMinRows is used with <textarea> element. It is declared in CdkTextareaAutosize Directive as following. We can use minRows property in TS file to get configured autosize minimum rows. It defines maximum amount of rows in the textarea for autosizing. cdkAutosizeMaxRows is used with <textarea> element. It is declared in CdkTextareaAutosize Directive as following. We can use maxRows property in TS file to get configured autosize maximum rows. Now find the sample example of textarea with autosize configurations. Find the TS file code snippet. resizeToFitContent() method of CdkTextareaAutosize is used to resize the text area to fit its content. It accepts Boolean value. By passing true we can force a height calculation. By default, height calculation is performed only when value changed since the last call. reset() method of CdkTextareaAutosize resets the textarea to original size. When we configure cdkAutosizeMinRows and cdkAutosizeMaxRows in textarea, it is auto resized. On calling reset(), textarea resizes to its original size. Find the HTML code snippet to test resizeToFitContent() and reset(). NgZone is an injectable service for executing work inside or outside of the Angular zone. Find the complete code to create inputs using reactive form. <input matInput type="password" formControlName="password" placeholder="Password"
Find the complete code to create inputs using template-driven form. <input matInput type="password" name="password" ngModel required placeholder="Password"